There seems to be little to endear citizens to their legislature or to the president trying to influence it. It’s too bad, because even with the wrench thrown in by Republican Scott Brown’s election in Massachusetts, this Democratic Congress is on a path to become one of the most productive since the Great Society 89th Congress in 1965-66, and Obama already has the most legislative success of any modern president — and that includes Ronald Reagan and Lyndon Johnson. The deep dysfunction of our politics may have produced public disdain, but it has also delivered record accomplishment. The productivity began with the stimulus package, which was far more than an injection of $787 billion in government spending to jump-start the ailing economy. More than one-third of it — $288 billion — came in the form of tax cuts, making it one of the largest tax cuts in history, with sizable credits for energy conservation and renewable-energy production as well as home-buying and college tuition. The stimulus also promised $19 billion for the critical policy arena of health-information technology, and more than $1 billion to advance research on the effectiveness of health-care treatments. Any Congress that passed all these items separately would be considered enormously productive. Instead, this Congress did it in one bill. Lawmakers then added to their record by expanding children’s health insurance and providing stiff oversight of the TARP funds allocated by the previous Congress. Other accomplishments included a law to allow the FDA to regulate tobacco, the largest land conservation law in nearly two decades, a credit card holders’ bill of rights and defense procurement reform. The House, of course, did much more, including approving a historic cap-and-trade bill and sweeping financial regulatory changes. And both chambers passed their versions of a health-care overhaul. Financial regulation is working its way through the Senate, and even in this political environment it is on track for enactment in the first half of this year. It is likely that the package of job-creation programs the president showcased on Wednesday, most of which got through the House last year, will be signed into law early on as well. Most of this has been accomplished without any support from Republicans in either the House or the Senate — an especially striking fact, since many of the initiatives of the New Deal and the Great Society, including Social Security and Medicare, attracted significant backing from the minority Republicans. How did it happen? Democrats, perhaps recalling the disasters of 1994, when they failed to unite behind Bill Clinton’s agenda in the face of uniform GOP opposition, came together. Obama’s smoother beginning and stronger bonds with congressional leaders also helped. But even with robust majorities, Democratic leaders deserve great credit for these achievements. Democratic ideologies stretch from the left-wing views of Bernie Sanders in the Senate and Maxine Waters in the House to the conservative approach of Ben Nelson in the Senate and Bobby Bright in the House, with every variation in between. Finding 219 votes for climate-change legislation in the House was nothing short of astonishing; getting all 60 Senate Democrats to support any version of major health-care reform, an equal feat. The White House strategy — applying pressure quietly while letting congressional leaders find ways to build coalitions — was critical. While health care reform did not pass in the first year, there are still signs that Congress will not just let it die as it did after Hillary Clinton failed years ago. Epitaph One was a brilliant idea for a clip show after the first season of Dollhouse but it left far too much open to conclude in a single hour. Epitaph Two, the series finale, has the look of a show written to quickly tie everything up with as happy an ending as is possible. (Note major spoilers here). 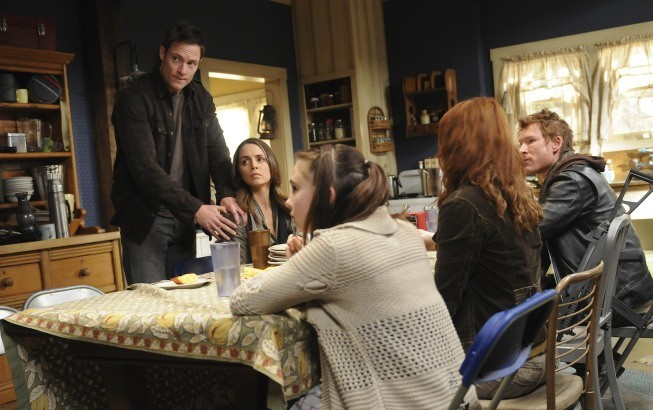 The episode begins with the people who found the Dollhouse and restored Echo’s memories in a child in Epitaph One but does have them meet up with major characters from the series. (Without any explanation, however, Whiskey is no longer present in the Dollhouse as she was in the first part). When they ultimately reached the safe haven it was disappointing to see it look like little more than a farm house with a handful of people. I imagine we couldn’t expect more for a single episode. The journey to the safe haven included escaping from Neuropolis, the remains of Rossum’s empire, and rescuing Topher. Rossum was forcing Topher to create a device to wipe the minds of the remaining humans but instead he was working on a way to reverse the mind wipes and restore everyone to their original state. To complete this necessitated a return to the Dollhouse. This led to Paul’s death and a reunion with Alpha, which was happier than anticipated. Everything was wrapped up far too neatly. The memories were restored, but this doesn’t change the fact that the earth is in ruins and it is possible that the technology could be used again. Problems which grew over the past several years between Tony/Victor (who took on a Mad Max persona) and Priya/Sierra were quickly resolved. It was forgotten that Paul’s feelings for Caroline/Echo had been wiped, but I imagine that the could have returned over a decade. Even Paul’s death led to a happy ending as his memories were added to the large collection in Caroline/Echo’s head, with Echo remaining underground in the Dollhouse for a year to prevent her from reverting to her original state. Rebirth was the first regular episode of Caprica to air since the pilot which was released on DVD months ago. 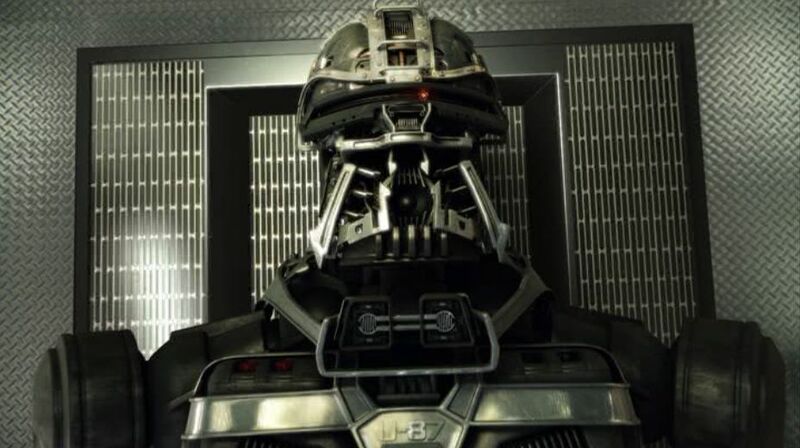 We know how things ultimately end with the Cylons developing into a robot race which turns on their human masters, but there are many story lines beginning. Whether the show is a success will depend more upon these story lines as opposed to the overall arc. Much of the show depends upon secrets. Zoe is keeping her presence in the Cylon’s body secret. Her father, while not really knowing she survived, seems to somehow still know she is not totally dead, leaving him uninterested in a memorial service. He is keeping this from Amanda. Amanda is shown to also be oblivious to much of Zoe’s life, including her boy friend. I did find it unrealistic when Amanda learned some information at the end that her first instinct was to speak out in public about her daughter being a terrorist as opposed to protecting her, or at least seeking more information first. There are additional stories also being developed, from a polygamous relationship which seemed less dramatic as compared to those on Big Love to a young Willie Adama being instructed in a life a crime (which we know he never took up) by an uncle. There is a lot to work with in this series, giving it considerable promise. The final season of Lost premieres on Tuesday and the first four minutes, including what happens after the bomb goes off, is seen in the video above. There are many interviews with the cast and crew (such as here) but little real information is revealed. The video does reveal, as most suspected, that the explosion would reset everything as opposed to killing off the cast. There has also been speculation as to whether Claire returns alive or as a ghost. Emilie de Ravin did tell TV Guide, “I think I’m alive, as far as I know.” That’s about as definite as anything anyone is saying about the final season. Blogator Who has posted the audio of an interview with Billie Piper on the Scot Mills Show in which she was asked about a movie adaptation of Doctor Who. Her response: “they are doing it.” Tardis and Torchwood Treasures reports on another interview with Piper in which she says she does not believe she will appear again as Rose. Despite NBC being desperate to fill five hours left open by Jay Leno returning to The Tonight Show, prospects are not looking good for the pilot David Tennant filmed entitled Rex is Not My Lawyer. The series has been placed on hold and the sets are being taken down. NBC will also not be filling these hours by airing the BBC version of Merlin as they did last summer but American audiences will still be able to see the second season. Instead of showing it on NBC, it will be shown on SyFy, which is also owned by NBC Universal. I guess now Merlin knows how Conan O’Brien feels. SyFy will also rerun the first season before showing the second. The BBC has also picked up the series for a third season. The main function of Fox, talk radio, and the rest of the right wing noise machine is to keep conservatives misinformed about the actual views of liberals so they can retain their support for the right and blind hatred against everyone else.